Power Curbers, Inc. was formed in 1953 in Salisbury, NC, USA, the home town of one of the founders, to manufacture curb equipment. Today, the company remains true to its roots in curb and gutter, corporate location and family ownership. Power Curbers 5700 Series curb machines lead the world market. The company is founded by two Salisbury businessmen, John S. Henderson, an engineer, and E.L. Hardin, mayor of the city, to manufacture extruding curb equipment for city streets and for developing land into subdivisions. 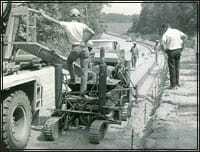 The first machine, the 55-A Automatic Extruder, mechanized an otherwise time-consuming, manual process of laying out highway turnarounds and median islands. It was described as extruding asphalt much like toothpaste is extruded from a tube. Todays Power Curber 150 and 440 XL are walk-behind pieces of equipment, pouring either asphalt or concrete curb. The original invention is applied to curb and gutter work. This proves to be a major step for the company. Richard Messinger, son-in-law of John Henderson, joins the company as president, concentrating on domestic and international markets and building a dealer network. The first concrete slipform machine, the Curb King Model 6500, is manufactured. 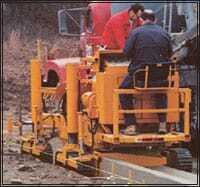 It held the patent for the first 4-crawler slipform machine. The Curb King Model 6500 is the first slipform machine to pour in the offset position, now an industry standard. Dyke Messinger, son of Richard Messinger, becomes president and CEO, with concentrations on research and development, customer focus, and diversification. Richard Messinger receives the U.S. Department of Commerce’ s E Award for Excellence in Exports from President Ronald Reagan. 5700 Series begins, leading Power Curbers to the #1 position in the world in the sale of curb and gutter slipform machines. The 5700 features the hydraulic offset, allowing the machine to maneuver around obstacles quickly. The 5700 Series also slipforms sidewalks, highway safety barrier, bridge parapet, and special applications, such as stadium risers, channel paving, bicycle and golf cart paths up to 8 feet (2.44m). Associates link themselves to mission statement: Our Commitment Shows. Power Curber machinery is chosen to pave the railbeds in the running tunnels for the Eurotunnel project beneath the English Channel between Dover, England, and Calais, France. The machinery slipformed the railbed and left-hand right-hand sidewalks on the sloped walls of the tunnels. A total of 31 miles (50 km) of railbed and 62 miles (100 km) of sidewalk was completed from Calais in a record 9 months, as opposed to 17 months of doing the same work by hand from Dover. Power Curbers wins Governors New Product Award from the North Carolina Professional Engineers of North Carolina for the Eurotunnel Rail Tunnel Invert Concrete Paving Machine design. 5700-B, with enclosed auger for better mixing capability and increased productivity, is introduced. The 5700-B wins a Top 100 New Product Award from Construction Equipment magazine. Richard Messinger is inducted into the Construction Equipment Hall of Fame. Quick Connect Mold Mount System is introduced, allowing operators to change molds in a matter of minutes, as opposed to more than 30 minutes by hand. Power Curbers improves service to customers by establishing regional sales and service managers in the following states: Maryland, Delaware, Pennsylvania, New Jersey, Illinois, Iowa, Ohio, Indiana, West Virginia, Tennessee, Georgia, Florida, Texas, Oklahoma, Arkansas, Colorado, Washington, Utah, and California. Power Curbers forms Power Pavers, Inc., in Cedar Falls, IA, a manufacturer of concrete slipform pavers, placer spreaders, texture cure machines and form pavers that produce product up to 32 feet wide, with extensions, for residential streets, highways and airports. Power Curbers/Power Pavers wins Measures of Success marketing award from Publications in Construction and Agriculture, Association of Equipment Manufacturers Marketing Council. The 5700-SUPER-B is introduced, with 50% more horsepower, for faster production. The 5700-SUPER-B wins a Top 100 New Product Award from Construction Equipment magazine and a Top Rollout Award from Better Roads magazine. Power Curbers is selected Manufacturer of the Year for Global Logistics Excellence, World Trade magazine. Post-hole Digger Attachment for 5700 Series machine receives Top Rollout Award from Better Roads magazine. The 5700-C is introduced, with the capability to pour on either the left or right-hand side and Smart Amp™ controls, giving the machine operator greater flexibility for adjusting sensitivity. 5700-C wins Top 100 Products Award, Construction Equipment magazine. Corporate headquarters moves to a new manufacturing facility in Salisbury that is geared to customer response. The new facility allows for an intense focus on delivering the utmost value to customers, with manufacturing designed to eliminate waste, drive down lead times and drive up parts delivery. Products are being sold in 80 countries. Power Curbers receives Registered Trademark for Smart Amp™ Control from U.S. Patent and Trademark Office. Power Curbers receives Progressive Manufacturing Award from Managing Automation magazine. The 5700-C-MAX is introduced, with the skeleton of a 5700-C and the inclusion of key options, it is optimized to handle larger applications. Power Curbers celebrates its 60th anniversary. Dyke Messinger is inducted into the Association of Equipment Manufacturers Hall of Fame.